THE LEGAL ENVIRONMENT OF BUSINESS provides a detailed practical introduction to the structure and function of the legal system from the perspective of the professional non-lawyer. 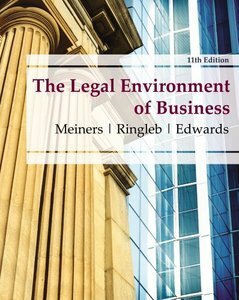 With a strong emphasis on the nuts and bolts of basic legal rules, this popular text effectively adapts a traditional case focus for the unique needs of business students. Incorporating clear and concise coverage of a wide range of up-to-date topics, the Eleventh Edition of this trusted text introduces key points of law through compelling business-specific examples and realistic scenarios that students can understand and appreciate. The authors' highly readable style and judicious use of humor complement their extensive knowledge and expertise, making the text both an exceptional teaching tool and a favorite among instructors and students alike.